Heath’s Panhard #7 racer was blue, the racing color of France, with white numbers. The front of the car, which was the air intake for the radiator, was black. All three cars sported the same color scheme. The Panhard radiator had enough capacity for almost 10.4 gallons of water, as compared to one to three gallons for car radiators today. Fuel capacity was 34 gallons, about the size of a late model Chevrolet K2500 pick-up truck. Weighing in at 2,204 pounds, the blue machine was up to the limit of the Vanderbilt Cup Race rules. The four cylinder engine had a displacement capacity of 988 cubic inches or nearly 16 liters. This is large by today’s standards, where a 2007 Chevrolet Suburban’s engine is 5.3 liters or 323.3 cubic inches. Both the bore and stroke of the engine was 6.8 inches. This configuration produced 90 horsepower and turned approximately 750 revolutions per minute at full speed in high gear. The car had a foot brake as well as an emergency handbrake lever. The power was delivered to the wheels through a four-speed gearbox, with a reverse gear. Connected to that was a drive shaft, somewhat unique in an era when most cars used bicycle-style chain drives. The Panhards accounted for three of the seven cars using drive shafts in the race. The Panhard had a wheel base, as measured from the hub of a front wheel to the hub of a rear wheel, of 78.8 inches or 6 feet, 6 inches. From one rear hub to the other the car was 3.42 feet wide. As for the wheels, front and back had slightly different dimensions. The front wheel and tire was 34.25 inches and the tire was 3.6 inches wide. In the back, the rear wheel was slightly larger at 36.8 inches – more than three feet – and the tire was 4.8 inches wide. The wheel-tire assembly of a typical van today is about 26 inches tall and tires are seven inches wide. The Panhard’s wheels were the finest quality hardened wood, suitable for artillery use, such as cannons. Ten spokes stretched out to the heavy wooden rims. Traversing a circuitous path through history, Panhard prospers today as the manufacturer of tactical military vehicles. Established in 1888 as Panhard and Levassor by Rene Panhard and Emile Levassor, the company manufactured wood working machines. This business was a derivative of another firm that had built gasoline burning engines as early as 1876. 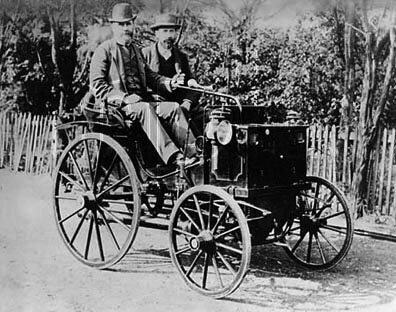 The two men saw the opportunity of the emerging market for automobiles and built their first car based on a license from Germany’s Daimler Motor Company in 1890. Panhard and Levassor rapidly established a reputation for quality machines. They became the first manufacturer to travel from Paris to Versailles without mechanical failure in 1892. This was followed by another journey of 140 miles between Paris and Etretat at the impressive speed of six miles per hour. Several successes in the earliest automobile speed contests, such as the 1895 Paris-to-Bordeaux–to-Paris open road race, established the company as one of the best car manufacturers in the world. They continued to reign as one of the leading forces in auto competitions until losing interest in 1907. In addition to George Heath’s Vanderbilt Cup win, the company scored victories in the Gordon Bennett Cup, Circuit de Nord, and Circuit des Ardennes (three times) between 1901 and 1904. In 1901 eight Panhards made up a large part of the field for major road races across Europe. Racing yielded dividends with the development of new innovations. Panhard and Levassor was credited with introducing the modern transmission, a foot pedal clutch and a drive shaft as opposed to the bicycle-style chain drive. They also introduced the first front engine, rear drive cars which became the standard design for most of the twentieth century. When Levassor died in 1897, Panhard opened the firm to stock investors and hired a professional business manager, Arthur Krebs. Krebs remained at the helm for the next 19 years, guiding the business to great success until his departure in 1916. Rene Panhard’s nephew, Paul Panhard, ascended to the top executive position at Krebs’ resignation. During World War I the company produced military equipment, as did most manufacturers. In 1919, they made a strategic decision that would cost them an opportunity to expand their business with the growing demand for automobiles in the 1920’s. Management forsook the emerging mass production techniques to remain focused on low volume, handcrafted products. The company concentrated on large luxury cars, as well as railcars, airplane engines and light armored vehicles. By this time the corporation was simply known as Panhard, and their reputation for design leadership continued. In the 1930’s they introduced their opulent Panoramique and Dynamic models, brainstorms from the fertile minds of engineer Louis Delagarde and coachbuilder Louis Bionier. Panhard once again proved its mettle in motor sport as driver George Eyson set a new track speed record in February 1934 driving the company’s 290 British horsepower 35 CV Special at 133.750 miles per hour. But it all nearly crashed to the ground as Panhard was forced to reorganize in 1936 during the worldwide depression. The company invested its resources into commercial and military products to survive. After World War II French government regulation limited the use of steel in cars to concentrate on rebuilding the country’s damaged infrastructure. This forced Panhard to innovate with new applications for aluminum. In 1947 they introduced an all-aluminum car, the Dyna, complete with an air cooled aluminum engine. From 1950 to 1953 Panhards re-emerged in motor sport with fiberglass bodied sports cars designed by engineers Charles Deutsch and Rene Bonnet competing at the 24 Hours of Le Mans. Known as the Panhard DBs (Deutsch-Bonnet), they dominated classes for small engine cars of the era. Panhard entered into a strategic alliance with Citroen in 1955 to manufacture and sell their automobile models. In 1965 Citroen acquired Panhard. They discontinued the Panhard automobile line in 1968. Citroen operated the Panhard brand as a manufacturer of light armor military vehicles. After Citroen was acquired by Peugeot in 1976, Panhard continued as a subsidiary of that company, now known as PSA Peugeot-Citroen. When Panhard lost a major bid for military business in 2005, it was acquired by its contract-winning rival, Auverland. 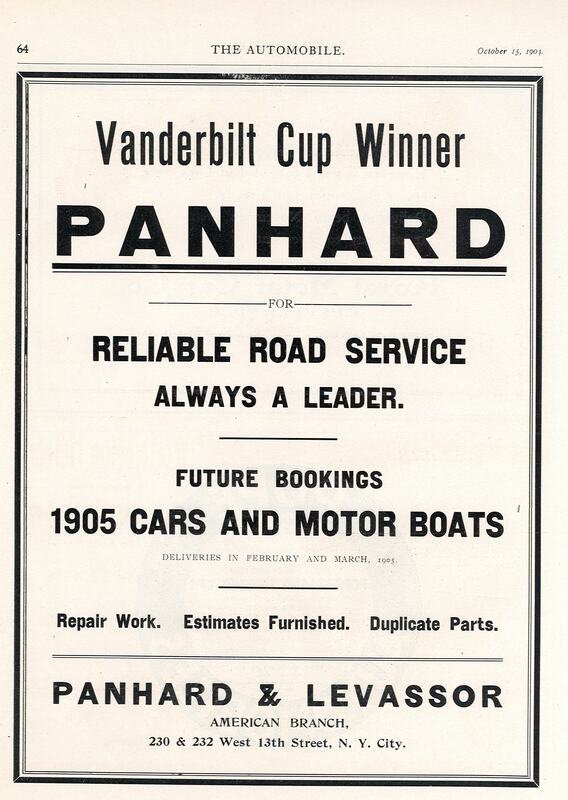 Reasoning that the Panhard name had greater brand equity, the combined firm became known as Panhard.